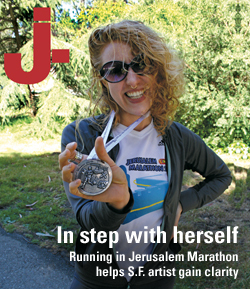 Running in Jerusalem Marathon helps S.F. artist gain clarity – J. It was cold and raining heavily the morning of the second annual Jerusalem Marathon, with sporadic showers of hail careening off the streets. As she found her way to the starting line, Rebecca Ora remembers being terrified that she was going to slip and break her neck. “That would be it: I would fall and die trying to run the Jerusalem Marathon,” the 30-year-old San Francisco resident says with a hearty laugh. Preparing for the start, Ora wondered about how the seasoned runners from other countries would react to the “typical” Israeli sights she was used to — armed soldiers lingering on the street, or young Orthodox girls in skirts down to their ankles handing out water bottles to passing runners. In place of the packaged electrolyte drinks and energy gel shots available on the sidelines of U.S. races, there were fresh Israeli dates. Ora ended up placing 371st overall out of around 1,000 runners in the 26.2-mile race, and 21st in her division (women 20 to 39), with a time of 4 hours, 11 minutes, 52 seconds. Not only did she triumphantly finish her first-ever full marathon, but she also recorded most of the journey on a waterproof HD sports video camera. Although she captured as many of the sights and sounds as she could, there’s one thing the footage doesn’t quite show: the back story of how this self-proclaimed atheist got to the starting line, and how the run came to mean so much to an American girl who once had what she described as “zero interest” in ever visiting Israel. Two months after the race, the artist and filmmaker is just getting back to her normal routine. Six days a week, she gets out of bed at her apartment in San Francisco’s Lower Haight neighborhood and runs through the Panhandle, through Golden Gate Park and to the beach. Then she runs back. It’s 10 miles in total, most days. These days, the run also serves as stress reliever as she heads into the thick of the production process for her documentary, which will delve into the connection between her decision to run the Jerusalem Marathon and her complicated and changing relationship with Israel. She plans to bookend the film with footage from her upcoming run in the San Francisco Marathon the last weekend in July. Land fascinates Ora, as do the different ways an individual can take ownership of it. The second eldest of seven kids, the daughter of a mother from Brooklyn and a father from Jerusalem, Ora grew up in an observant family, attended an Orthodox school near Los Angeles — and was leery of whether Israel could live up to the myth created around it. Still, her sense of Jewish identity was strong. After entering the Old City through the Jaffa Gate, runners face a tight squeeze. She attended Brandeis University, studying with a professor who researched the outcomes and efficacy of Birthright Israel trips. It wasn’t long before she was on a plane to Israel. Ora used that journey to comfort a cousin who’d just lost her mother, and even though the two ended up traveling and having a positive experience, Ora remained skeptical that she should feel any personal connection to the Jewish state. But after returning to the U.S. and graduating from college — faced with the age-old question of “What now?” — she found herself drawn back to Israel. A cousin who lived there passed on information about an arts residency at the WUJS Institute (World Union of Jewish Students) in Arad, located on the border of the Negev and Judean deserts. “I lived there for a year in the desert, with Bedouins and donkeys, the whole deal,” she says. 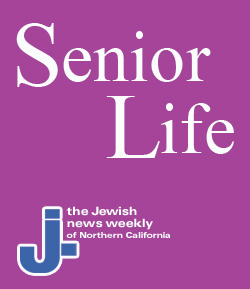 Around that time, her teenage brother and his friends, who were all about to leave on a Holocaust study trip through Europe, were attacked on the streets of Los Angeles. They were wearing kippot. Something about his passion stuck with her. Ultimately, she enrolled in 2008 in a two-year graduate program in social practices at the California College of the Arts in Oakland. The curriculum allows students to work in new media, political art and discourse, says Ora, who works mainly in film. Runners mingle with family, friends and spectators at the finish line in Jerusalem’s Sacher Park. In the summer of 2009, her views on her Jewish identity were shaped indelibly by a trip to Sweden, where she set out to make a film about anti-Semitism and anti-immigrant attitudes in the wake of a huge riot that had occurred outside an Israeli-Swedish Davis Cup tennis match in Malmo, Sweden in March 2009. Some 6,000 people carried signs reading “Turn left, smash right” and “Boycott Israel,” and the protest turned violent when about 200 militants began pelting police with stones, fireworks and paint bombs, according to Reuters. “It was a fascinating experience, because there are so many recent immigrants in Sweden, largely from the Middle East and from Africa; the cultural makeup of the country is really shifting,” she says. “And when it comes to anti-Israel sentiment, you had these white, right-wing Swedes coming together to hold hands with Muslim immigrants to protest this match. She wore a Star of David necklace the whole time she was in Sweden, despite well-meaning strangers and acquaintances constantly advising her against it. Ora graduated from CCA in 2010 with a master’s in fine art and was awarded the prestigious Toby Devan Lewis Fellowship, a $10,000 prize for MFA students who show exceptional promise. Again, she found herself unsure of her next step or direction. Rebecca Ora after the Jerusalem Marathon. Below, stills from the film she is making. So she started running. It didn’t really matter where. She ran a series of half marathons (13.1 miles) over the next 18 months. And somewhere in that time, she realized she had to go back to Israel: She had things to say. Ora realized running the Jerusalem Marathon — physically traversing the ancient city, pushing her body to its limits — could be her way to serve Israel. Without a religious practice or a particularly personal take on the Israeli-Palestinian conflict to help her forge a connection to the land, the idea of physical exertion in Israel took on a level of spirituality for the filmmaker. 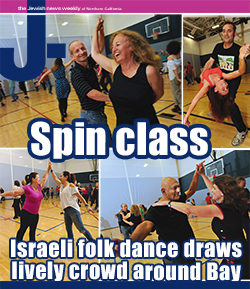 Ora applied for a Haas/Koshland grant through the S.F.-based Jewish Community Federation to help with funding. She started keeping a blog (www.irunjerusalem.wordpress.com) about the project in January 2012, detailing her thoughts, hopes and fears about Jerusalem, San Francisco and identity politics as she trained. She flew to Israel a week before the race to check out the course and spend time with her cousins. The day of the race was March 16, and Ora remembers noting the demographics of the other runners lined up for the 26.2-mile marathon. Not too many of them were Israelis, she observed. “It’s a fairly new thing for them,” she says. Since the marathon was on a Friday, local officials had advised residents to get their Shabbat shopping done early, as the city would be difficult to get through. Residents and families gathered along the sidelines to watch. When it began, Ora didn’t think about keeping pace with anyone else. She took in the sights around her, put what she’d learned about stretching the limits of her body and her attention span to use, and felt the ground under her feet with each step. When it was over, Ora was exhausted and covered in mud — experiencing more of an emotional and physical high than she knew was even possible. “Running is significant because it re-establishes that analog nature of movement in time and place,” she says. “I don’t really understand the distance between New York and Los Angeles, because I’ve only traveled it by plane. I sort of understand the distance between L.A. and San Francisco, because I’ve driven it a lot. But I really understand the distance between my house [in the Lower Haight] and the beach: I know what it tastes like, what it smells like, its length and time. “And now I had a bit of that — just a beginning of an understanding — in Jerusalem,” she says. As she’s editing and planning the next part of her documentary, the moments after the race are still fresh in Ora’s mind. “They ushered us into this tent and handed out medals and trophies, and then all of a sudden everyone was just shoving food into their faces,” she recalls, laughing. “There were these huge piles of fruit and cake and Turkish coffee, and people were just stuffing handfuls of cake into their mouths, that’s how hungry you get. She shakes her head at the memory.